When it comes to day trips our family of four is professional. We wake up early, prepare and pack food and snacks, and everybody (even the dog if he is allowed) is ready to get out the door. 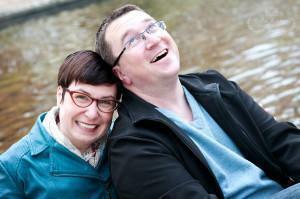 We have lived in Stuttgart Germany for more than eight years. 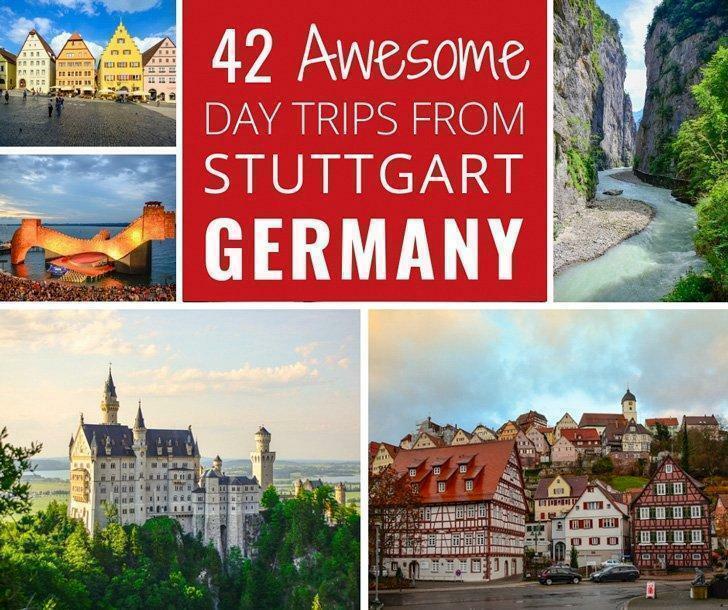 During this time, we have taken many day trips, and I want to share 44 of our favourites, including plenty of castles near Stuttgart, Germany and beyond. If you don’t live in the Stuttgart area like we do and you need accommodations, check out availability at the top-rated hotels in Stuttgart. Fifty-four minutes from Stuttgart is Hohenzollern Castle, the ancestral seat of the House of Hohenzollern and one of Germany’s best castles. 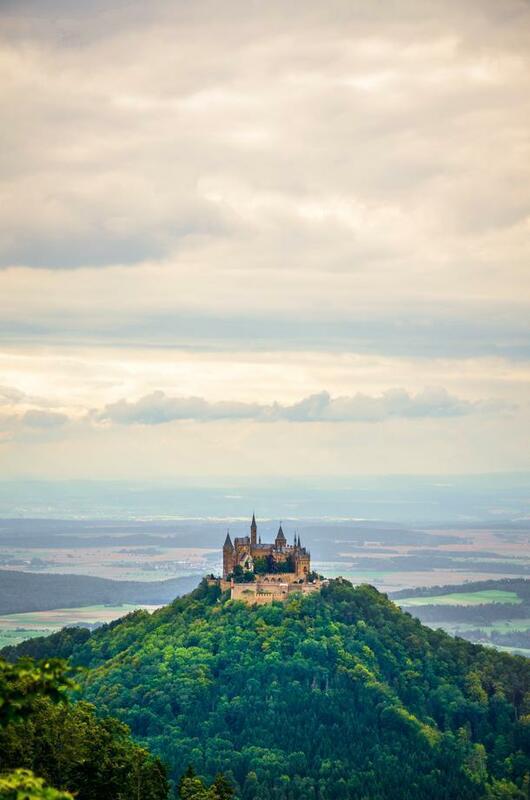 The 11th-century castle is perched on Berg Hohenzollern, 234 m (768 ft) above the towns of Hechingen and Bisingen in Baden-Württemberg. If you get there early, you beat the crowds and have the place to yourself. We parked the car at the bottom of the hill and walked to the castle. This may present a challenge to some, but I assure you the effort will be rewarding. Among the artifacts inside the castle, you will be able to see a letter from US President George Washington thanking a Hohenzollern descendant for his service in the American Revolutionary War. My favourite place to view the castle is at the location Raichberg 1, 72461 Albstadt-Onstmettingen. From here you get the perfect bird’s eye view of this magnificent construction. 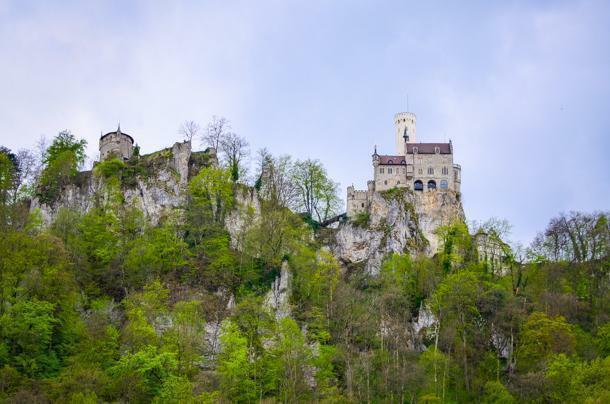 Just 55 minutes away, near Honau, you will find another of the castles near Stuttgart; Lichtenstein Castle, a Gothic-style castle built in the 1840s. The castle is still inhabited by royalty, namely the Duke of Urach, but it is open to the public. Here you will be able to see an impressive collection of medieval weapons. There are other activities near the castle such as a tree canopy walk; ideal for older kids and grown-ups. Hohenneuffen Castle is a large ruin in the Swabian Alb foothills, 25km from Stuttgart, above the town of Neuffen, Germany. You park quite close to the castle and then take a 1 km inclined hike. It is tiring if you are not in shape (like me) but the good news is refreshing beer and food await at the top. 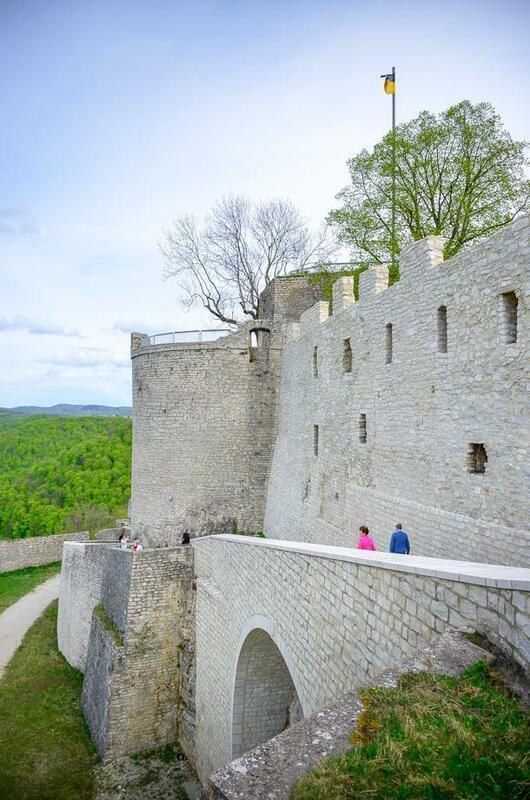 You can visit the castle walls, take part in falconry shows, and enjoy the views while dining in the gorgeous setting of the Burg Hohenneuffen restaurant. In this area, you can also hike and observe the cherry blossoms, in Kohlberg. 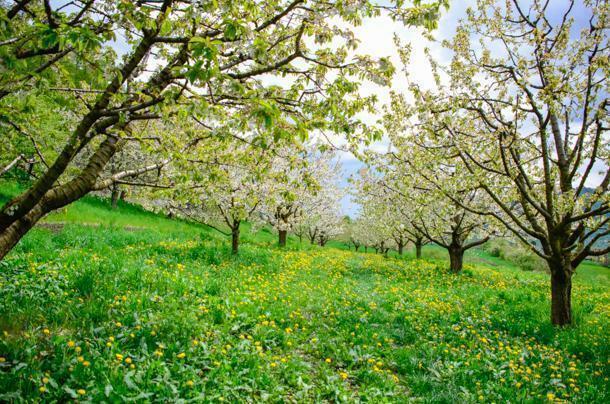 The region is abundant with cherry trees, near the volcanic mountain, Jusi. It’s one of the 350 volcanoes of the Bad Urach volcanic area, which was active about 17 million years ago. At the top, the view is splendid. There are several ways you can hike the mountain, but I think the woodland trail is best, especially on a hot day. It’s quite an incline, but at least you have shade, and the smell of the forest is gorgeous. Just two months after the death of King Ludwig II in 1886, Neuschwanstein Castle was opened to the public. Ironically, the shy king built the castle to withdraw from public life, and now crowds of people come to visit his private refuge. 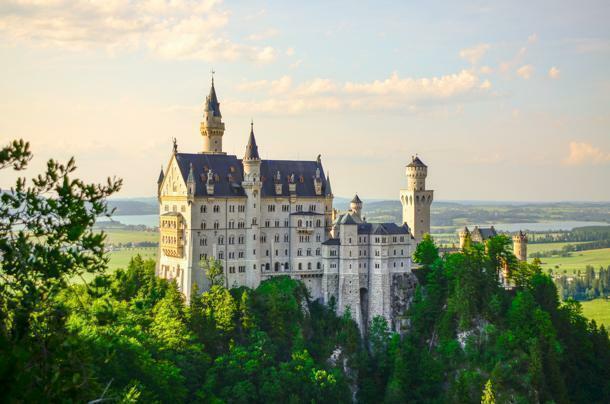 Today, Neuschwanstein is one of the most visited castles in Europe. 1.4 million people visit “the castle of the fairy-tale king” each year and in summer 6000 people a day stream through the ornate rooms. We have visited the castle four times, taking family and friends. The best part of visiting this castle, for me, is Marienbrücke or Mary’s Bridge. It’s the only view not obstructed by thousands of tourists. 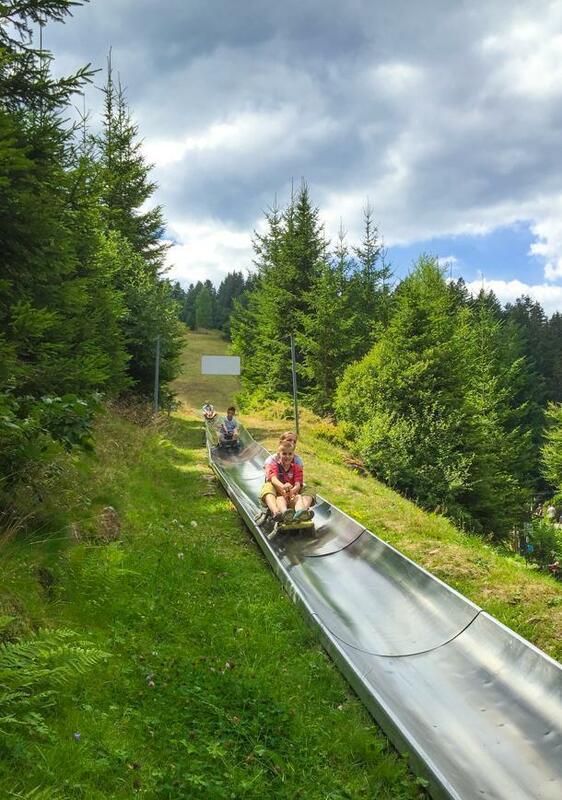 Situated in Enzklösterle-Poppeltal, Seewald Leisure Park is the perfect outdoor outing for a family with a love of adventure. 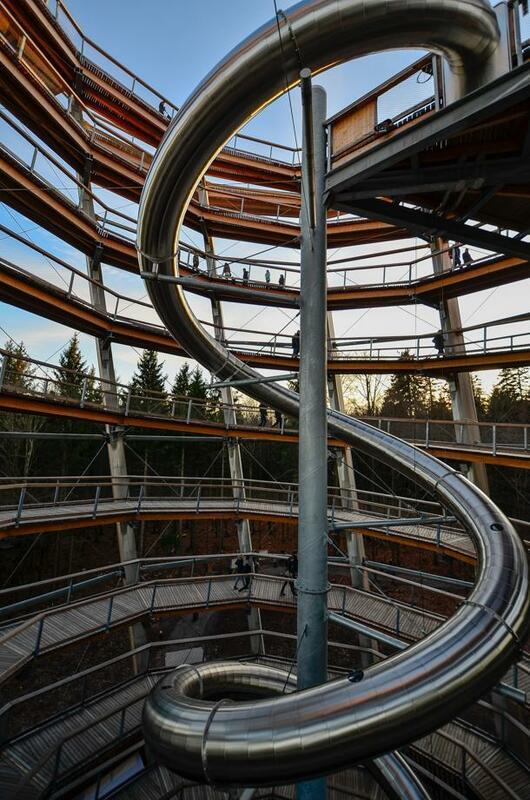 The park hosts the longest toboggan ride in Southern Germany, with a total of 1500m up and down. You are pulled up one side and go down the other, and it’s suited for people between 3 and 99. The area alone makes the hour and fifteen minute trip from Stuttgart worth the visit. You pass through lush forest and small, quaint villages. The park itself is in a thick patch of forest. Besides the toboggan ride, the park offers trampolines, water bumper cars, merry-go-rounds and other small rides for the little ones. The entrance is free; you only pay for the fun. The toboggan does not run if it rains or in winter. As far as payment goes, bring cash, as no cards are accepted. 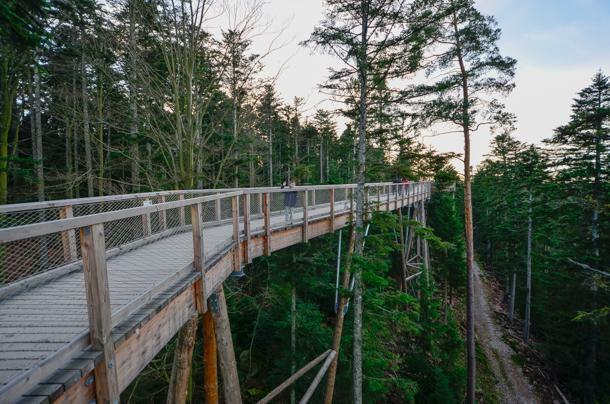 The treetop walk is 1250m in length and 20m above the ground. It ends with a cool 360-degree spiral lookout tower. Along the walk, you have different obstacles, which you can choose to go through. Being there with kids, of course, we had to tackle them. The entire area is superb. The thick Black Forest full of pine, fir, and beech trees is enchanting the senses from all directions. The sepulchral chapel on Württemberg Hill (Grabkapelle auf dem Württemberg ) was erected by King Wilhelm I in memory of his beloved wife Katharina, who died at a young age. Offering spectacular views over Stuttgart, this monument to eternal love is considered Baden-Württemberg’s most romantic spot. In addition to the chapel, take your time and enjoy the vineyards, especially in the fall. The smell of the grapes and the fresh air will make you hungry, and this is the perfect place for a picnic. Lay on the grass and enjoy the solitude as well as the views over Stuttgart. We have been to Frankfurt many times in the past but somehow only to run errands related to my American citizenship application. We had never visited for leisure until last year. The Altstadt (Frankfurt’s Old Town), on the northern Main riverbank, is surrounded by the Innenstadt district, Frankfurt’s present-day city centre. As the historic centre of Frankfurt, the Altstadt dates back to 794, but only small sections of the Altstadt were rebuilt after World War II. The Old Town contains many of Frankfurt’s highlights, including the Römerberg plaza and city hall and other buildings recreated in a Middle Age-style. If you feel fit enough (I wasn’t but did it anyway) to climb the 66 m tall tower (364 steps) of the St Bartholomew Cathedral, you will be rewarded with superb views of the city. 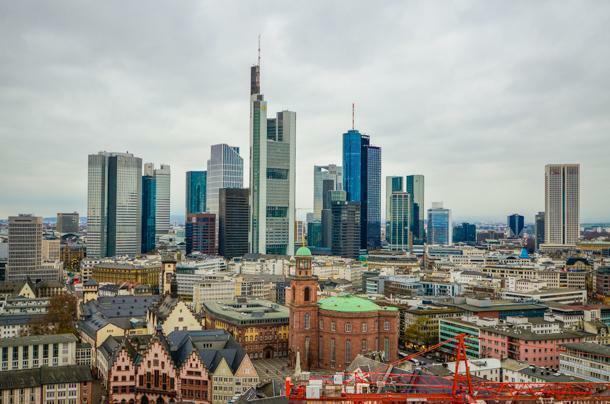 Frankfurt is one of the few European cities with high-rise buildings in its downtown area and is sometimes referred to as ‘Mainhattan’ (a mix of the local Main River and Manhattan), and ‘Chicago am Main’. 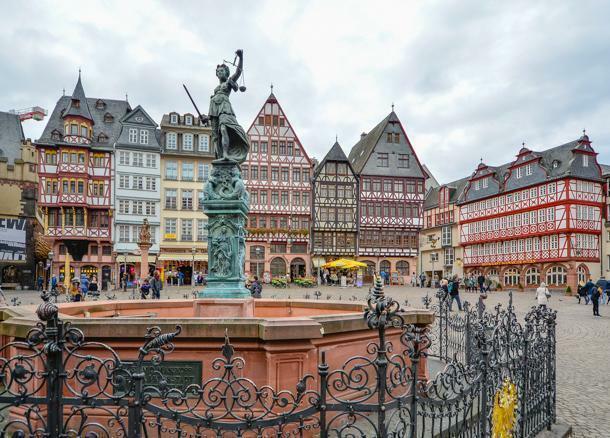 There are plenty of things to do in Frankfurt, Germany to keep you busy for days. If you plan to do a lot of sightseeing in Frankfurt, pick up the Frankfurt Card to save money and skip the lines. You can also check out some of the top attractions and tours of Frankfurt and book your tickets in advance. Rothenburg ob der Tauber is a UNESCO World Heritage Site that brings the Middle Ages and the Renaissance to life, before your eyes. You can experience the unique atmosphere of Rothenburg ob der Tauber when you stroll through town. You’ll discover history around every bend: lovingly restored house fronts, fountains, gables, bay windows and street signs all hint of the past. It’s a bit too touristy but gorgeously Medieval, and if you can stay until early evening, the streets clear and it becomes quiet. 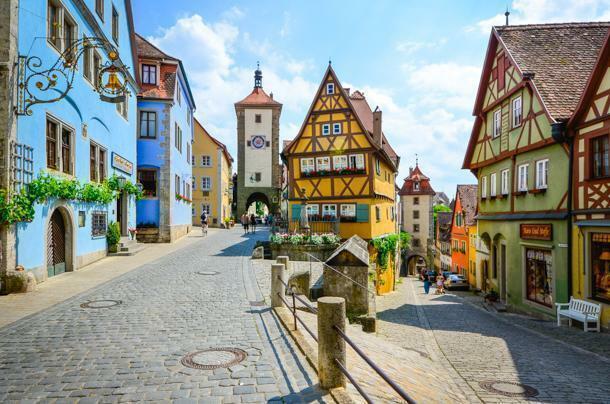 Rothenburg odT is one of three walled cities on the famous Romantic Road. Dinkelsbühl is a picturesque stop on the Romantic Road. 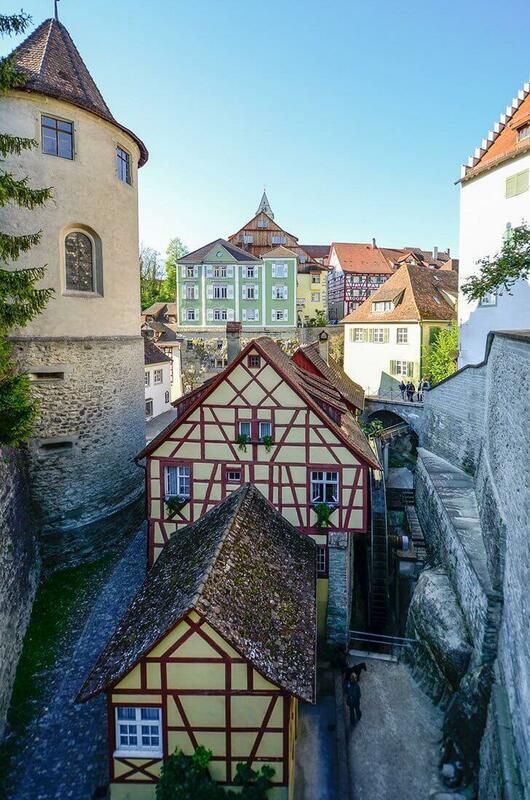 This historic town in the state of Bavaria, in southern Germany, is the third walled town on the Romantic Road. After Rothenburg ob der Tauber, Dinkelsbühl was my favourite of the three-walled towns. The colourful architecture and the solitude of the place were enchanting. 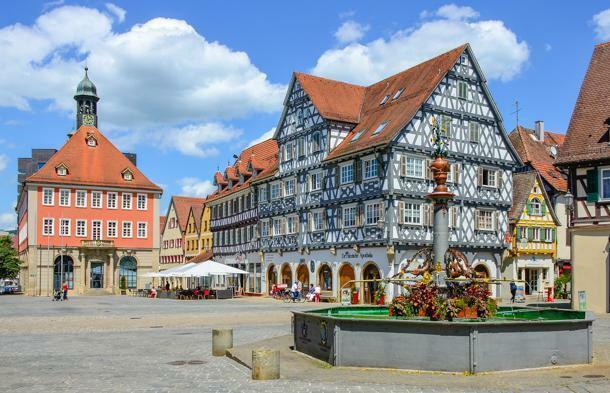 Dinkelsbühl remained untouched by the Second World War, which means it remains as it was in the Middle Ages when it was founded (sometime before the year 1083). The Wonderful World of the Brothers Grimm was filmed on location in Dinkelsbühl, just like it was in Rothenburg ob der Tauber. It’s only natural fantasy films would be filmed in fantasy towns. 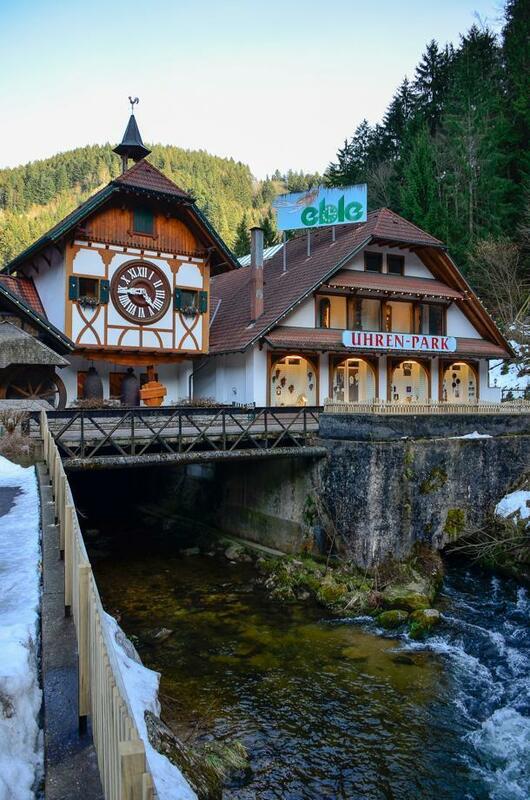 Triberg is a little town in the Black Forest offering the quintessential German experience; cuckoo clocks, lederhosen and dirndls, traditional German food and breathtaking forest landscapes. Triberg is also home to Germany’s highest waterfall, the Triberger Wasserfälle. The spectacular rapids plunge to a depth of 163m over seven cascades. I recommend visiting in summer so you can hike beside the waterfall, all the way to the top. Visiting Lake Konstanz every June has become a family tradition. 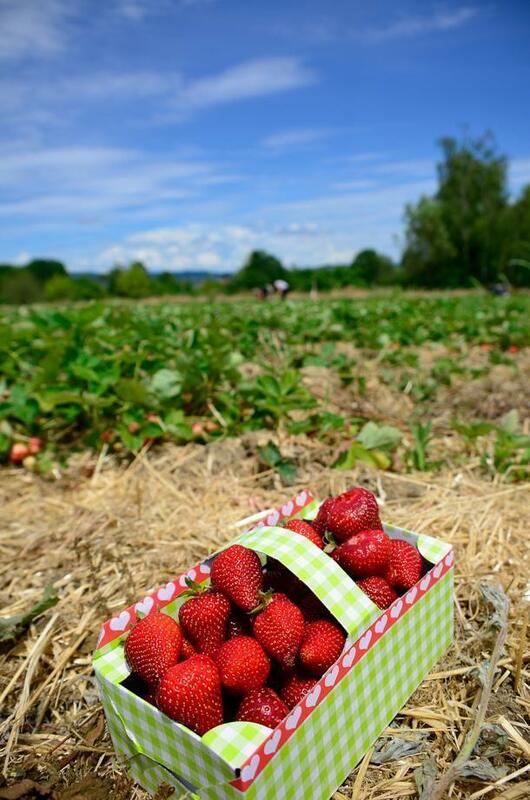 We go there to pick strawberries from our favourite farm in Dingelsdorf, Fuchshof. Then we usually cross the lake from nearby Vallhausen to Überlingen for yummy ice-cream and a walk on the town’s beautiful strand. 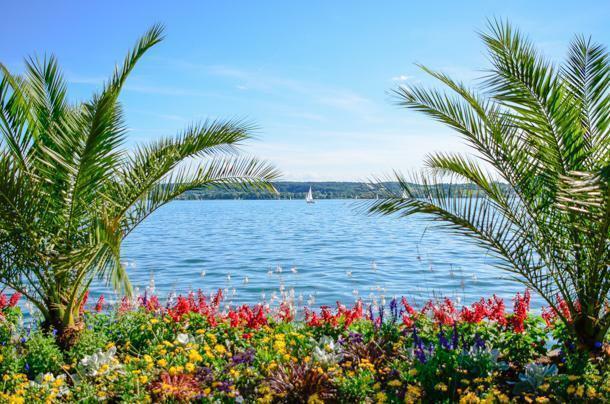 It feels like the south of France in Überlingen due to the gorgeous flower arrangements along the strand arranged beautifully by swaying palm trees. The trip to Dingelsdorf is 1.5 hours one way. The first record of Schorndorf was in 1235. In the 16th-century, Schorndorf was the second richest town in Württemberg after Stuttgart. Its viniculture, its wine and salt trade, as well as numerous other businesses, brought considerable prosperity. Schorndorf’s most prominent citizen is Gottlieb Daimler, whose groundbreaking invention, the high-speed light petrol engine, made automobile construction possible. I loved discovering this town and observing its beautiful architecture. Just 15-minutes north of Stuttgart, Ludwigsburg is one of my favourite places to visit in Southern Germany. The reason is the Ludwigsburg Palace. We usually visit in fall when the Palace is hosting an impressive pumpkin festival, where some 400000 pumpkins are used to create different themes. At Christmas, the town hosts one of my favourite Christmas Markets in the area. But the palace, as well as the town, is worth visiting at any time. It will surely impress. 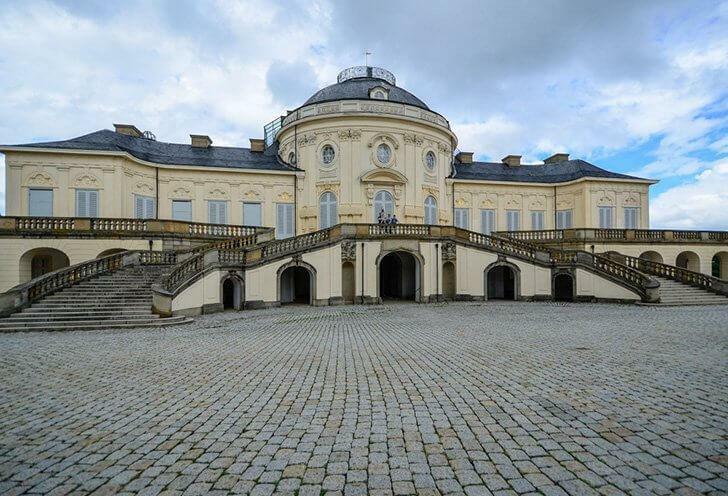 Living in the area, we have visited Ludwigsburg Palace on many occasions. The palace gardens are also quite the sight and worth visiting. This time though we wanted to explore the palace interior. To my infinite sadness, I discovered at the door that photography is not allowed in the palace. However, you can pay a fee and have a photoshoot inside, which is what I did at a later date. 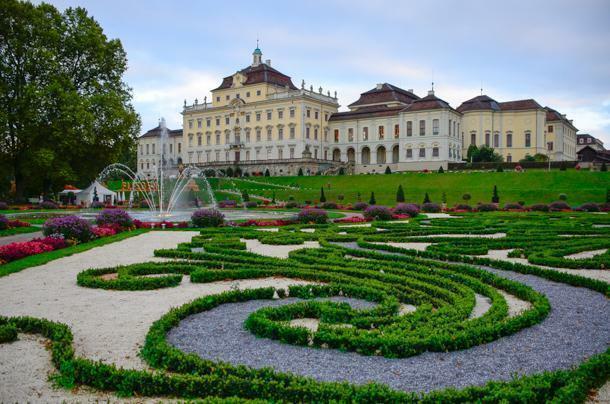 Ludwigsburg Palace is stunning with its 452-room designed in the Baroque, Rococo, and Neoclassical styles, located just seven miles from Stuttgart. During summer it gets a large number of visitors which is why they offer tours in English two times a day. Entrance is free with the Schlosscard and is also included in the StuttCard featuring the best Stuttgart attractions. 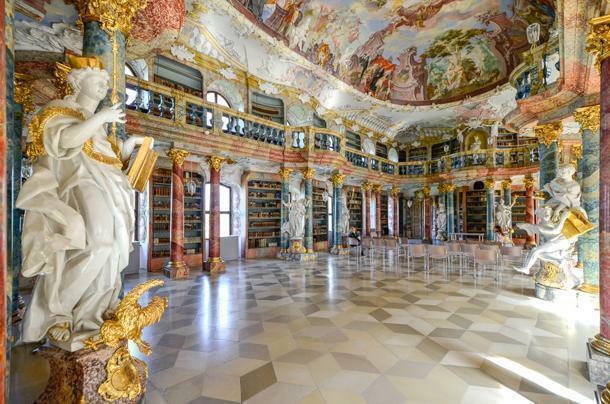 The Library Hall of Kloster Wiblingen is a masterpiece of the Rococo period. The rich sculptural decoration crowning the magnificent ceiling fresco creates an overwhelming impression and is the highlight of any visit to Wiblingen. The ceiling fresco deserves a post of its own. Franz Martin Kuen painted this masterpiece in 1744. His inspiration was both Pagan and Christian sources. 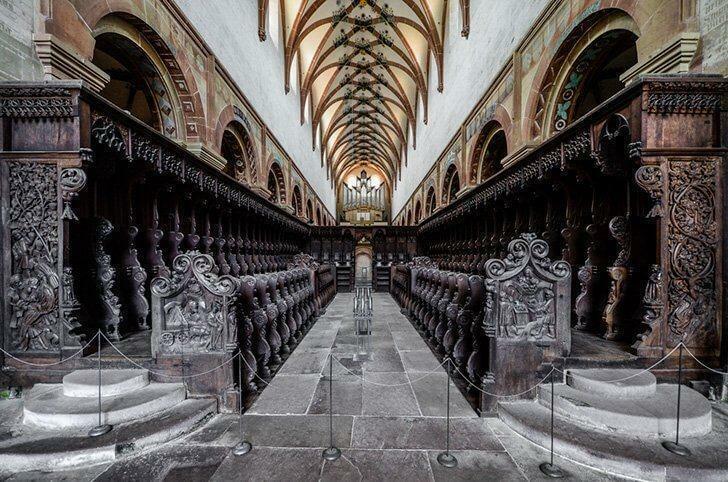 The Kloster Wiblingen Church will also impress you, inside and out. The dimensions are monumental at 72m long and 27m wide. There are little to no tourists around, and electronic information is provided in several languages. All you have to do is take a seat and enjoy the beauty unfolding in front of you. 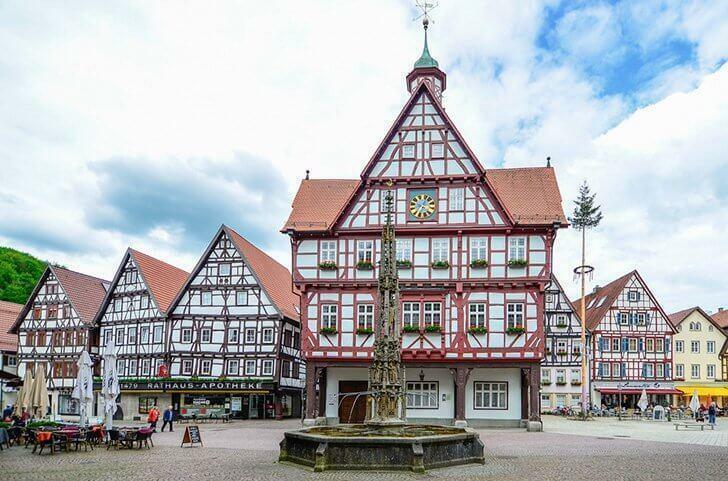 Weil der Stadt is a town of only 19000 inhabitants, often called the ‘Gate to the Black Forest.’ First mentioned in 1075, it was destroyed during the Thirty Years’ War, in 1648, and rebuilt. Weil der Stadt escaped destruction in WWII when a French artillery barrage was called off because it was Johannes Kepler’s birthplace. Kepler was a key figure in the 17th-century scientific revolution, best known for his laws of planetary motion. His work also provided one of the foundations of Isaac Newton’s theory of universal gravitation. The house-museum is right next to the city hall and costs 2 euros to visit. Young children visit for free. Weil der Stadt is also home to the best Fasching (carnival) festival in the area. I discovered Altensteig late last year, just in time for the Christmas Markets. You can see why I fell in love with this tiny town. Why go here? To witness the perfect picturesque Medieval townscape. Altensteig’s Christmas Market is one of the nicest and most diverse. 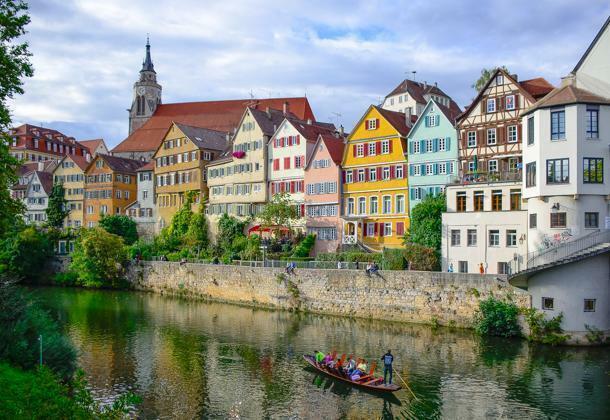 Tübingen is a traditional university town 30km from Stuttgart that displays impressive architecture. Tübingen is beautiful in all seasons, but it’s best in warm weather. Why? You can picnic in the park, by the Neckar River, and even go on a boat ride on the river. For a beautiful event, visit in September during the Umbria-Provençe Market hosted in the centre of Tübingen since 1995. The motto is ‘4 days worth of eating, drinking, looking and marvelling’. They are right; we ate, drank, looked, and marvelled. We visited Kloster Maulbronn last Spring, during Easter. We were determined to visit as many sights as we could in our county of Baden-Württemberg. You never quite realise just how much there is to see and do in your immediate vicinity until you sit down and explore your options. The county of Baden-Württemberg offers a Schlosscard (castle pass) that allows you to visit all the castles, gardens, and monasteries under the care of the government. Once you buy it, you have free entrance to all these sites. 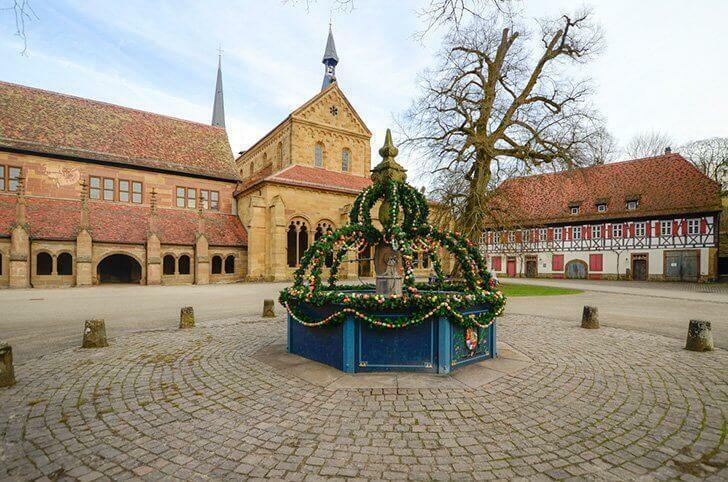 Kloster Maulbronn is one of the best preserved medieval monasteries north of the Alps. The architecture and cultural landscape of the Cistercians are virtually unadulterated. Because of this, in 1993, the monastery was included in the list of UNESCO World Heritage sites. If you choose to visit at Easter time, as we did, you will see the monastery festively decorated with brightly coloured eggs, and you can enjoy an excellent Easter egg market. The craftsmanship of the eggs is quite incredible. The admission was free with the Schlosscard. Last Easter we also visited the town of Michelstadt, an ancient, village in the county of Hesse. It was first mentioned in 741 by the Mayor of the Palace Carloman, who was Charlemagne’s uncle. 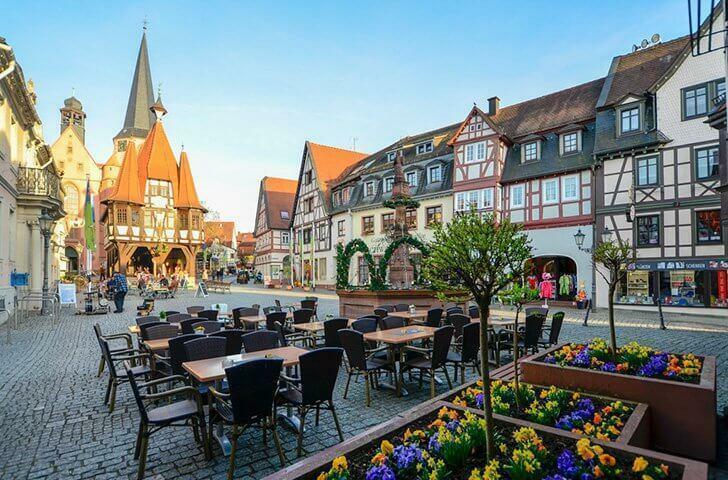 Because Michelstadt is relatively unknown to foreign tourists, it is easy to visit and explore. We walked the town up and down taking in its beauty. 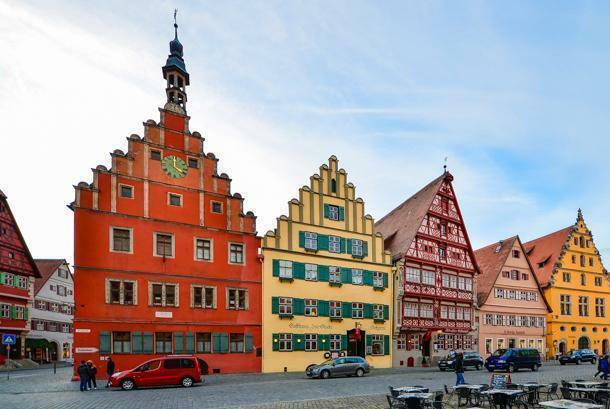 Exceptionally lovely is the timber-framed town hall, built in 1484 in late Gothic style. If you happen to visit at Easter, they too have a beautiful Easter market displaying extraordinary hand sculpted eggs. This monastery and palace was magnificent, well preserved, and a pleasure to walk through. Bebenhausen Kloster and Palace was a Cistercian monastery located in the village of Bebenhausen and was built by Rudolph I, Count Palatine of Tübingen, around 1183. Today it is a museum. 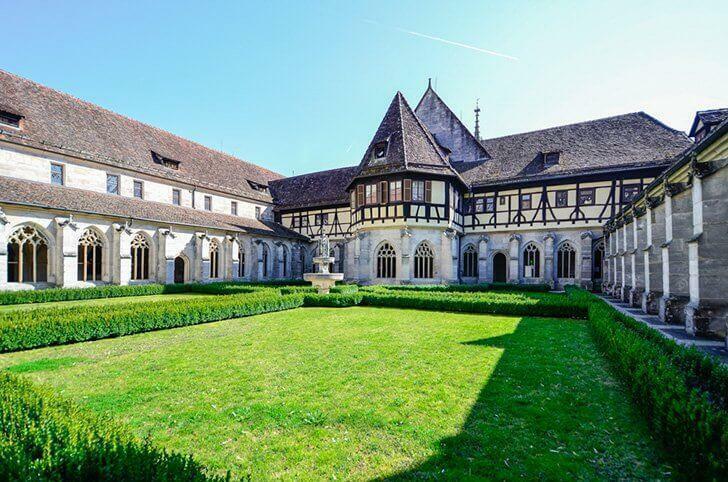 The site includes the church, main monastery building, abbot’s residence, guesthouse, infirmary, summer refectory, and the 19th-century Bebenhausen Palace. The exterior is dog-friendly and often used by photographers in their family photoshoots as the architecture is wonderful and exudes that old European feel. Entrance was free with the Schlosscard. The Pfahlbaumuseum Unteruhldingen is one of the largest open-air museums in Europe and has almost 300,000 visitors annually. Even so, at the time of our visit, it was not crowded, and even our dog was allowed to enter. It’s a beautiful visit on a sunny day. Bad Urach was probably one of our best day trips near Stuttgart. The little town is a timber house treasure. We combined it with the hike to the Bad Urach waterfall which was gorgeous and battery recharging. 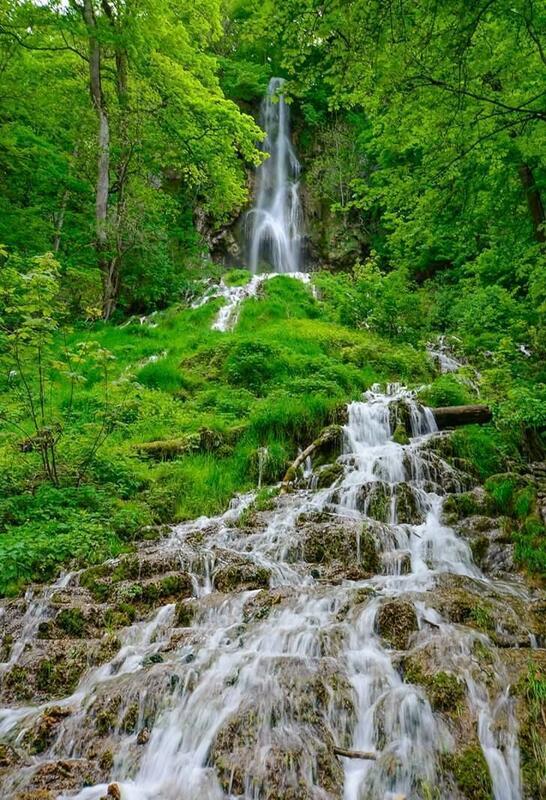 The stunning Bad Urach waterfall is an easy trek from the town centre and makes a great day trip. Bad Urach is located at the foot of the Swabian Alb (or Swabian Alps) and is known for its spa and therapeutic bath. But because we travel with our kids and dog, a visit to the spa was out of the question. Rest assured, our day was not wasted. The town is chock full of superbly preserved timber buildings which made me, and my camera very happy. We started the day with the simple trek to the waterfall and ended it with visiting the town. 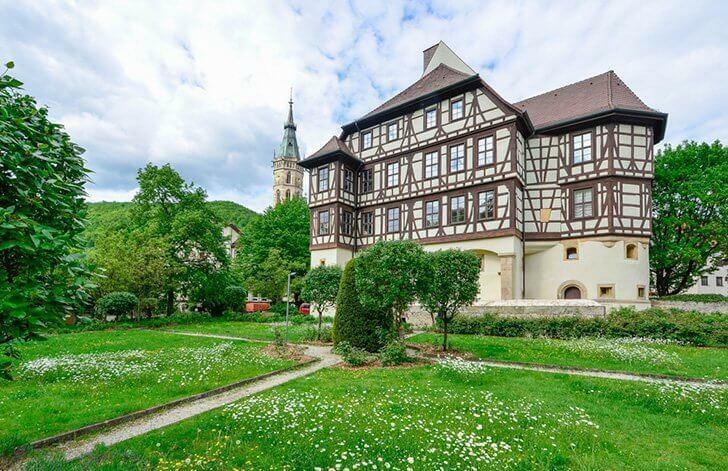 Visit the Residential Palace of Bad Urach, Germany. 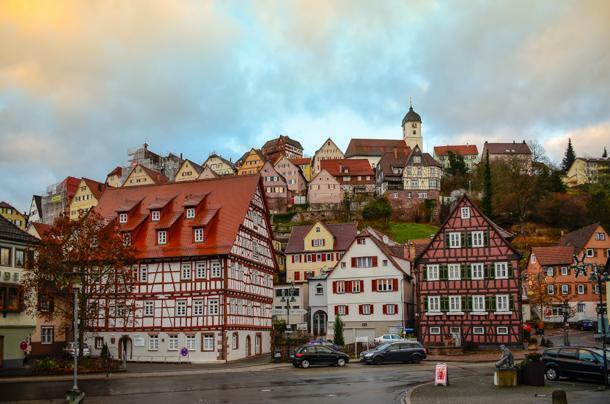 This tiny town is also home to the Urach Residential Palace, a palace complex built in the 15th century and modelled after the Alter Schloss in Stuttgart. 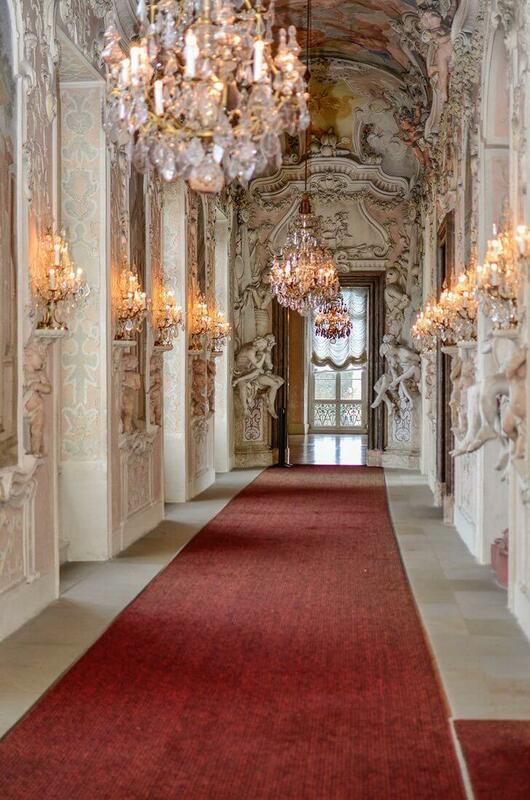 Visit this palace for the Goldener Saal (Golden Hall) and for the most extensive collection of Baroque sleds in the world. Entrance is free with the Schlosscard. Blautopf (or the Blue Pot) is located in the town of Blaubeuren, just outside the city of Ulm, and the perfect destination for an outdoor day trip. 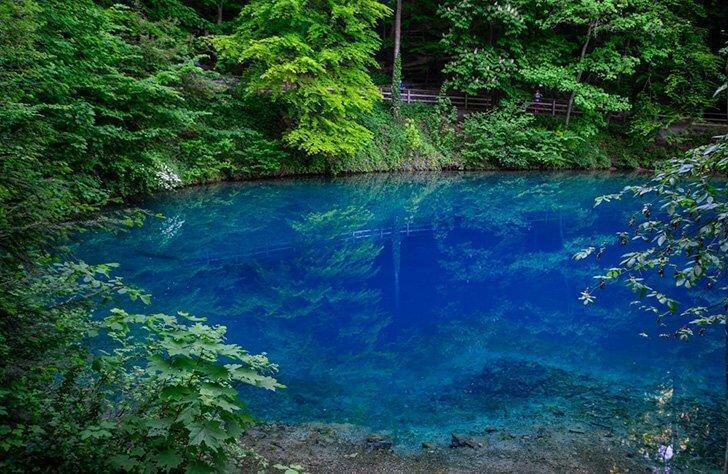 The blue appearance of the spring comes from the karst environment and is the result of the nanoscale limestone in the water. Light reflects off these particles and intensifies the blue colour. A similar effect is observed at the Blue Lagoon in Reykjavik, Iceland. Once you’ve observed this beautiful phenomenon, you can choose one of the hikes surrounding the site. There are plenty of options depending on how much time you have and your level of fitness. 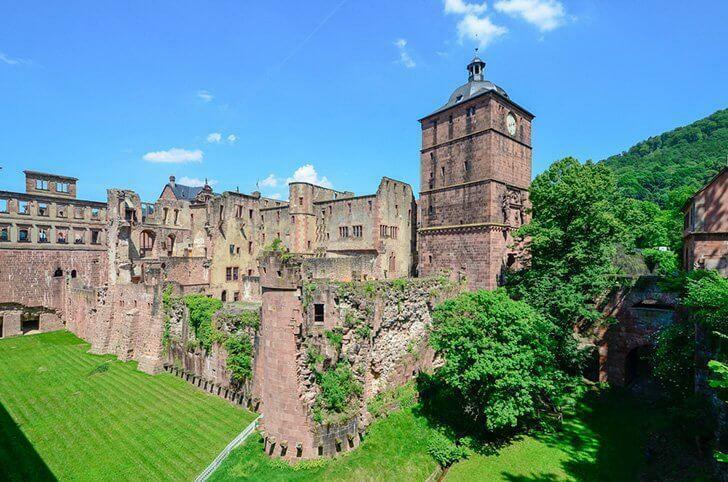 A visit to Heidelberg Castle makes an excellent day trip from Stuttgart, Germany. 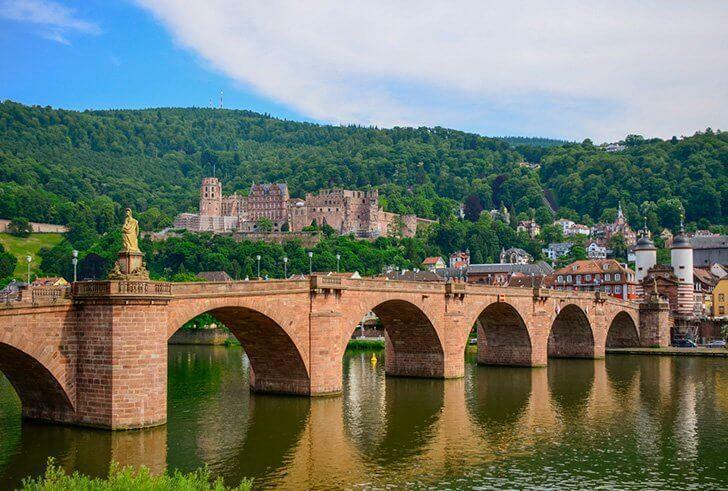 Heidelberg Castle is a gorgeous day trip destination. Nestled in a lush green area, 300m above the city, the castle stands resolute since its construction around the year 1300. The castle was used as a royal residence until it was destroyed by lightning in 1764 leaving it uninhabitable. Today it is a popular destination with almost a million visitors every year. One of the main attractions of the castle is the Heidelberg Tun, the largest wine barrel in the world with a capacity of 221,726 litres (58,574 U.S. gallons). To me, the views from the castle over the city of Heidelberg are worth the trip. Bring food and have a picnic in the perfectly manicured garden. Entrance is free with the Schlosscard. 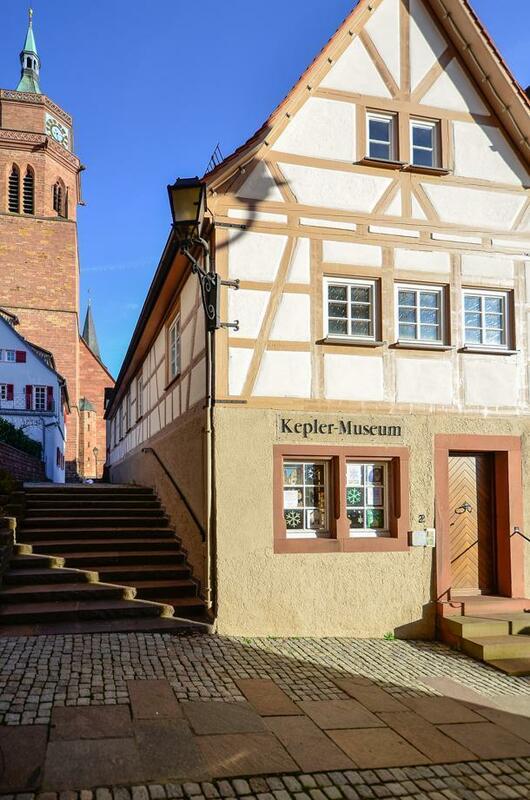 There are loads of activities in Heidelberg beyond the castle, so leave yourself plenty of time to explore. Salem Abbey and Palace is a former Cistercian monastery founded in the year 1136, in the town of Salem, not far from Bodensee Lake. Salem is another hidden gem in the south of Germany as it was not busy at all at the time of our visit. It’s a relaxing day trip and one that kids will enjoy due to the large garden that houses a labyrinth. Our kids had a great time waiting for the tour to start as well as at the end of it. The Abbey can only be visited by guided tour, and it is free with the Schlosscard. Solitude Palace is a small pleasure palace built between the years 1764 to 1775. It is an extremely popular and quite romantic hangout spot among the locals as it offers beautiful views of the city. At any time during the summer, families will relax on the green area in front of the castle. It is also a hot spot for family photographers as it offers beautiful memories of visiting Europe. Unfortunately, photography is not permitted inside. Entrance is free with the Schlosscard and with the StuttCard. 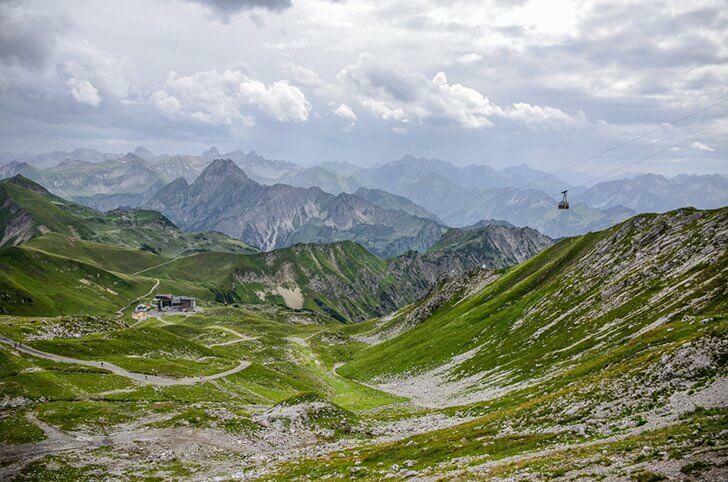 Nebelhorn in the Allgäu Alps makes a stunning day trip for the whole family. 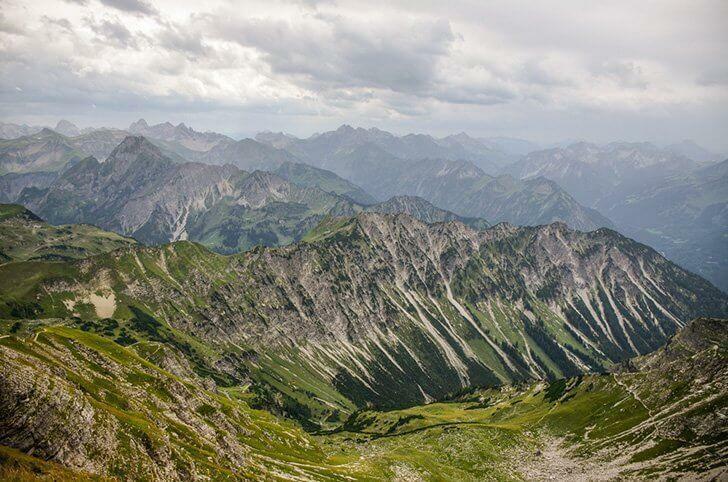 Another favourite day trip was visiting Nebelhorn in the Allgäu Alps, in the south of Germany. Drive to Obersdorf, park your car in the garage at the foot of the cable car and take a ride up the mountain. It will be an experience you’ll never forget. From the top, you can see the renowned 400 peaks. 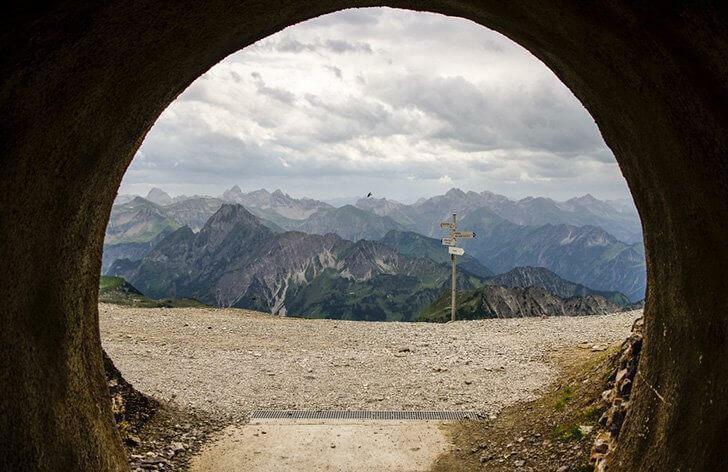 Nebelhorn in the Allgäu Alps offers a view of the 400 peaks. Along the way, there are three stops, and you have the option to get out and hike the area. The first stop, Station Seealpe, is a beautiful hiking area beside a perfect mountain lake of emerald green water. It’s the clearest lake I’ve ever seen in my life. There is a restaurant at the top, or you can bring food and picnic. Bring a picnic to enjoy atop the Nebelhorn mountain. Dogs are allowed all the way up but have to be muzzled in the cable car, no matter the size. Imagine our Cavalier King Charles Spaniel with a muzzle on. But rules are rules. If you do not have one, they have them for sale at the same place you buy the tickets for the cable car. 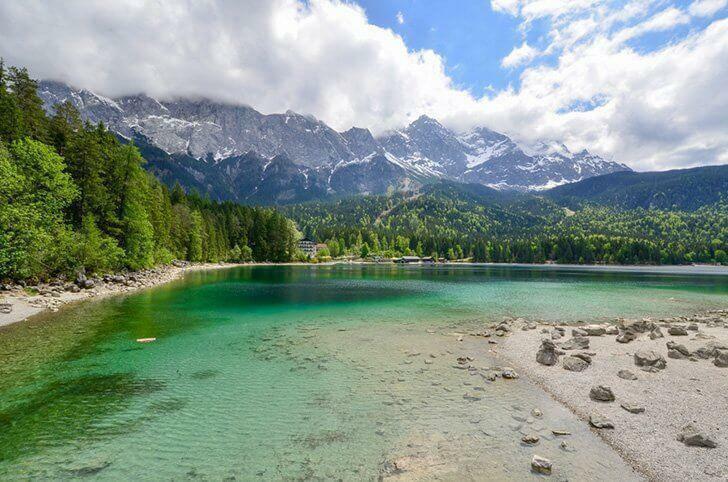 Eibsee is the perfect day trip destination for outdoor enthusiasts in Bavaria, at the foot of the Zugspitze, the highest mountain peak in Germany. If you are looking for a beautiful, relaxing trek, do not look any further than the one around Eibsee lake. The trail of 7.5 km (4.7 miles) starts at the parking lot in front of the Eibsee Hotel and is best hiked in a counter-clockwise direction. Once back at the starting point, you can enjoy a meal or ice cream at one of the restaurants. There are several souvenir shops if you need a keepsake from this wonderful region. Dogs are allowed all around the area, but they must be leashed. The Botanical Garden in Karlsruhe makes a great day trip for garden and nature lovers. 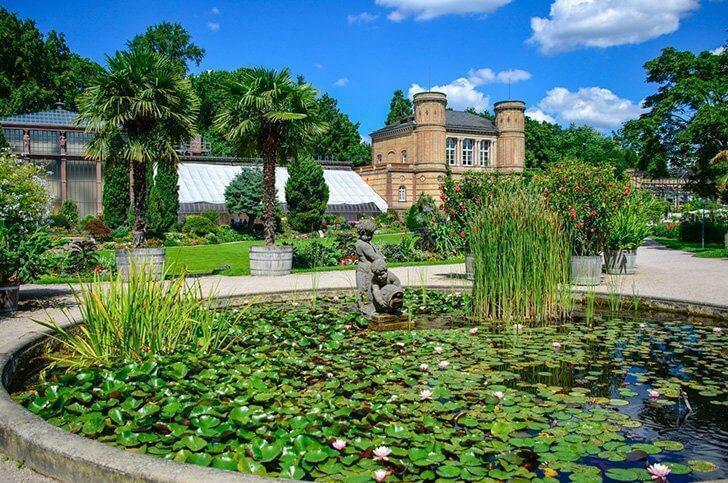 If you love to garden and want to see beautiful flower arrangements, the Botanical Garden in Karlsruhe is the perfect place to visit on a warm, spring or summer day. It is a green oasis and a haven of tranquillity in the heart of the city of Karlsruhe. Sadly, at the time of our visit, the greenhouse was closed due to renovation, but we thoroughly enjoyed the colourful outside displays of flowers, as well as the waterlily pond. Entrance in the greenhouse is free with the Schlosscard. 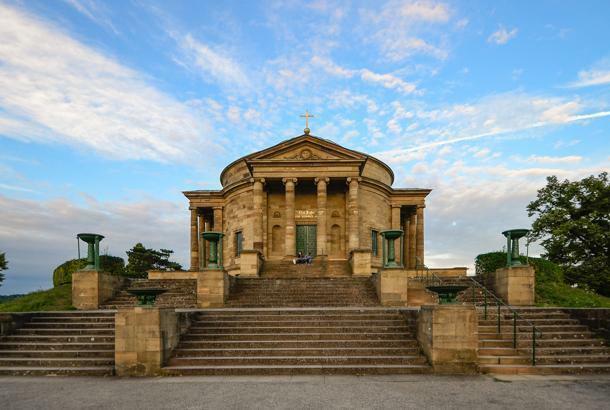 Take time to visit the Grand Ducal burial chapel of Karlsruhe. Because the Großherzogliche Grabkapelle Karlsruhe (Grand Ducal burial chapel of Karlsruhe) is located in Karlsruhe and we still had plenty of time after visiting the Botanical Garden we decided to check yet another site off our Schlosscard. 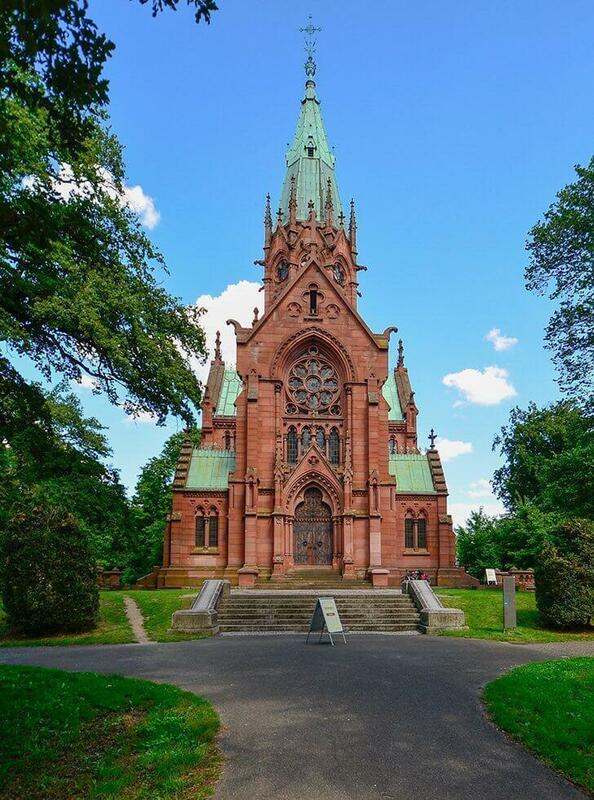 The Grabkapelle is an impressive little chapel with gothic elements such as gargoyles decorating its exterior. Here is the resting place of many royal figures of Baden-Würtemberg. The visit is very short, and a guide explains the different elements of the chapel. Rastatt Residential Palace is a lovely German day trip. 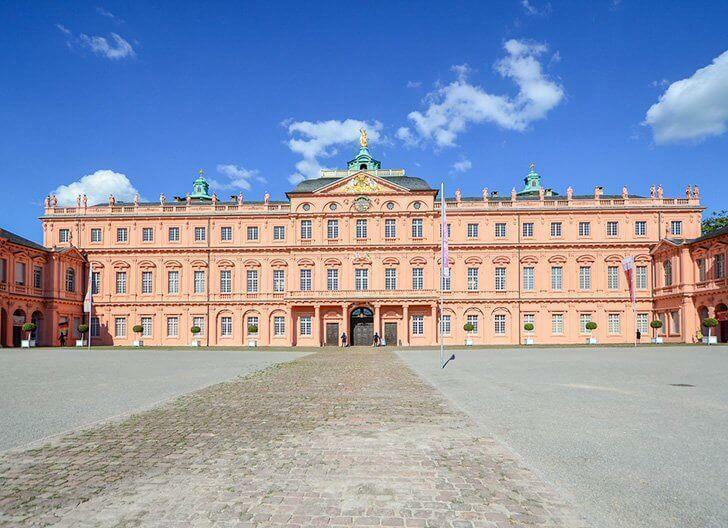 The Rastatt Palace is a Baroque palace and garden built between 1700 and 1707, in the town of Rastatt. The interior is impressive, particularly the stucco staircase and the Ahnensaal (the Ancestral Hall). You can visit only by guided tour, and the entrance is free with the Schlosscard. Birnau Basilica is one of the highlights of the Upper Swabian Baroque Route. Surrounded by vineyards, the pilgrimage church of Birnau rises majestically above Maurach bay. From the church, visitors can enjoy a breathtaking view down onto Uhldingen-Muehlhofen, and out across Lake Constance as far as the Swiss Alps. Unfortunately, photography is forbidden inside the basilica. Take the whole day for this trip as the views and the entire area are magnificent. Meersburg is a small town that packs a big punch. 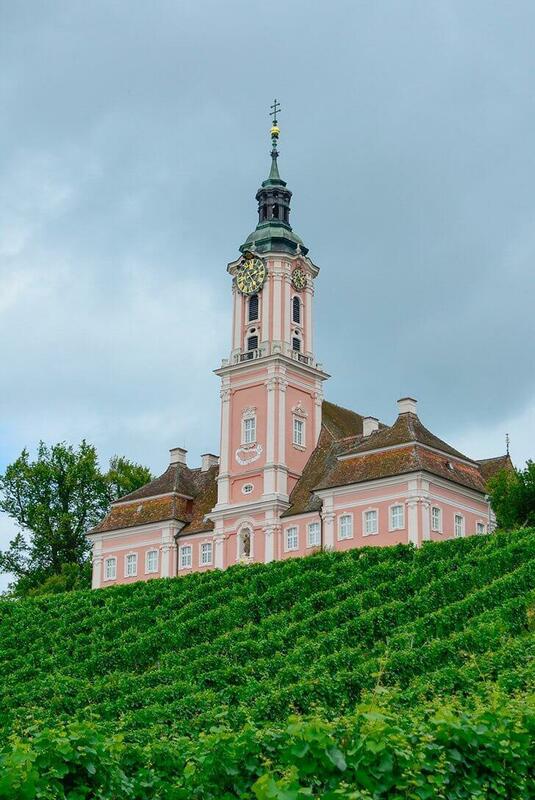 Built on a steep vineyard overlooking the Bodensee Lake, Meersburg has been attracting visitors for centuries; it is a cityscapers and wine lovers’ paradise. As a member of the “Deutsche Fachwerkstrasse” (the Timber House road), its centre is filled with these traditional architectural wonders. 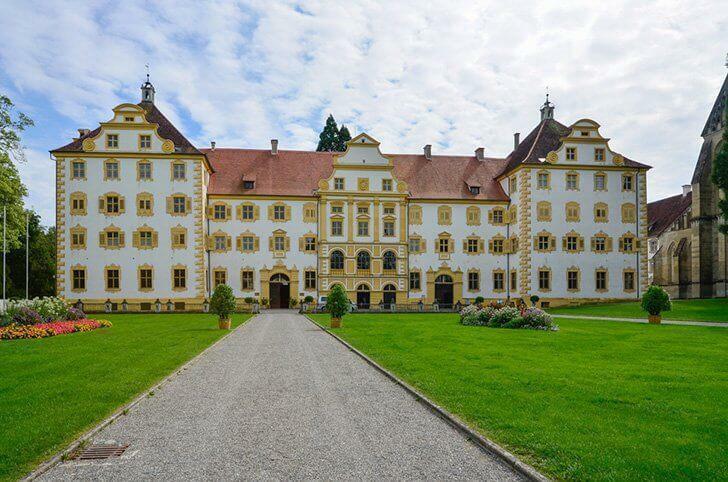 Make sure to visit the Meersburg Old Castle, the oldest inhabited German fortress, as well as Meersburg’s New Palace, the former residence of the Prince-Bishops of Constance. Both offer superb views over the town and the lake. The New Palace entrance is free with the Schlosscard. 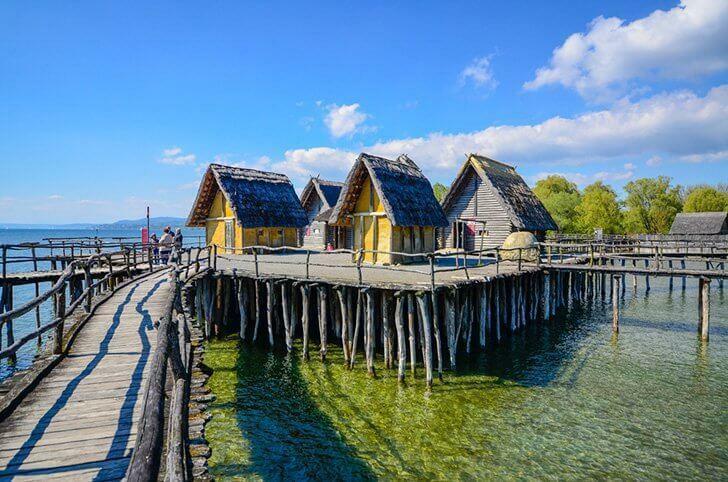 Spend an entire day here, taste the local food and enjoy the delicious wine. Cochem is one of Germany’s pretty Timber-framed towns. I had dreamed of visiting Cochem ever since we moved to Germany, three years ago, and in the fall of last year, my wish finally came true. It is a more extended drive from Stuttgart but oh so worth it. The drive alone is worth the trip. Once in the area, you drive along the Mosel river and hills covered in vineyards. When you reach Cochem, you’ll be enchanted by the narrow, romantic streets and its beautiful town centre. 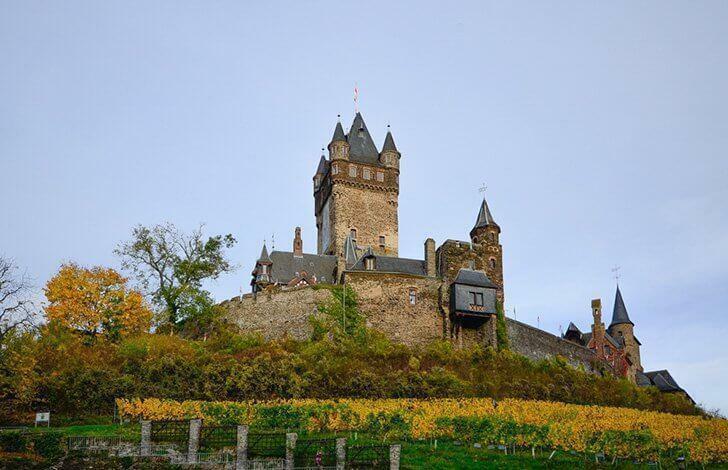 Do not miss visiting Cochem Castle built on top of the hill around the year 1000. For us, it was an unforgettable trip making us long for more visits in the Mosel region. A trip to Eltz Castle will combine a love of history with the love of nature. 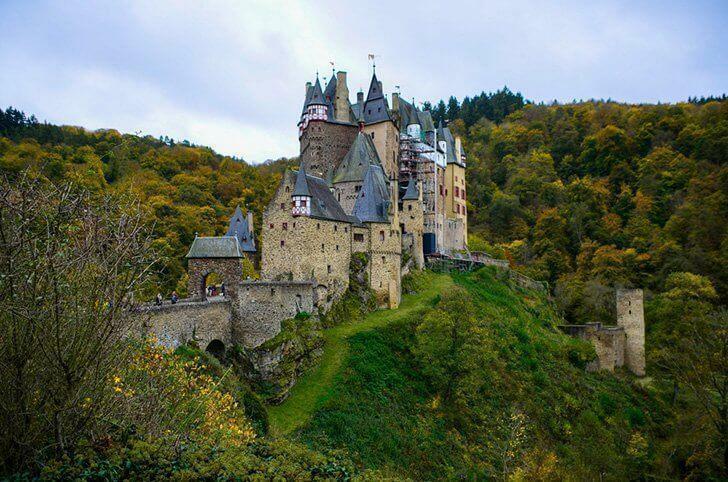 The castle has been situated in the Eltz forest for more than 850 years. I loved this visit because we parked the car and trekked to the castle. It is a leisurely trek, not longer than 15 minutes or so depending on how fast you walk. Feel free to bring furry friends on this trip but know that they will not be allowed in the castle, only on the castle grounds. We opted out of visiting the interior of the castle in favour of spending more time in the forest. 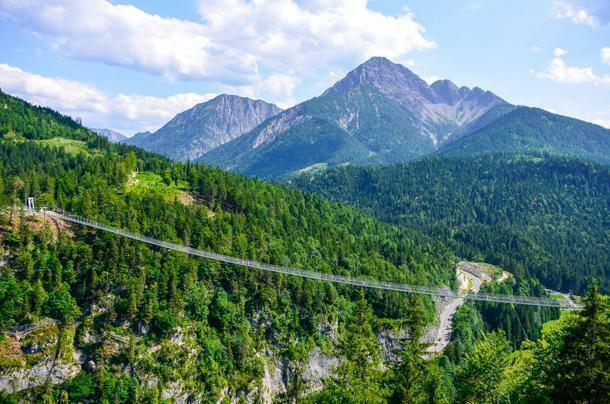 Highline 179 in Reutte, Austria is the world’s longest Tibet-style pedestrian suspension bridge according to the Guinness World Book of Records. The 406m bridge stretches 114 m above the B179 Fern Pass federal highway. Do not worry; an automatic entry system controls the number of visitors, and a maximum of five hundred people are allowed on the Highline at any one time. The bridge looks scary from down bellow, it looks scary from the top, and it’s scary when you are on it, but if you can face your fears, you will be rewarded with superb views of the area’s mountains as well as the Castle Ehrenberg ruins. It is about two and a half hours drive from Stuttgart. 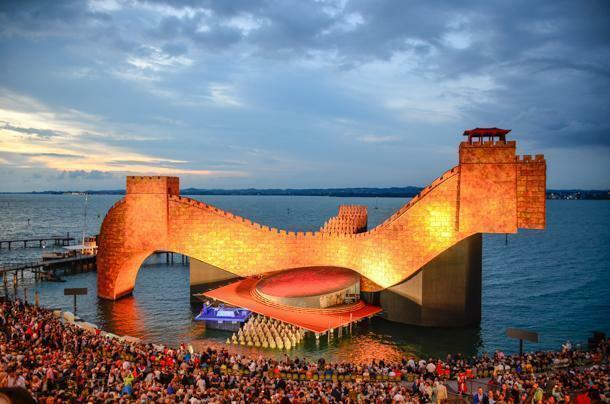 The annual Bregenzer Festspiele in Bregenz, Austria (a 2h drive from Stuttgart) attracts thousands of viewers. Last year, the play was Turandot, and it’s the same this year. Turandot is one of the most famous arias composed by Giacomo Puccini and it’s presented in its original language with German subtitles on large screens on each side of the stage. You can spend the day in Bregenz, a beautiful town on the Austrian side of Lake Konstanz, and end with an opera in a unique setting as the stage is in the lake! Yes, in the lake! Older kids are allowed too, although we did not take ours. It was a lovely day and date night. 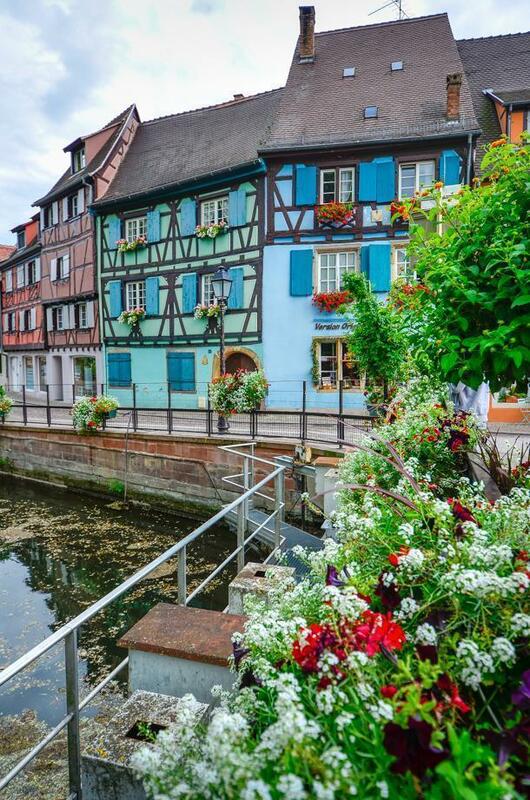 Colmar is a town in the Grand Est region (formerly Alsace) of France, near the border with Germany, about 2.5 hours from Stuttgart. 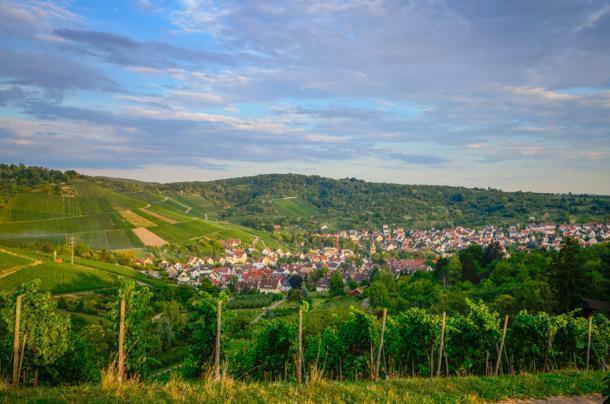 It’s on the Alsatian Wine Route and is considered the capital of Alsatian wine. 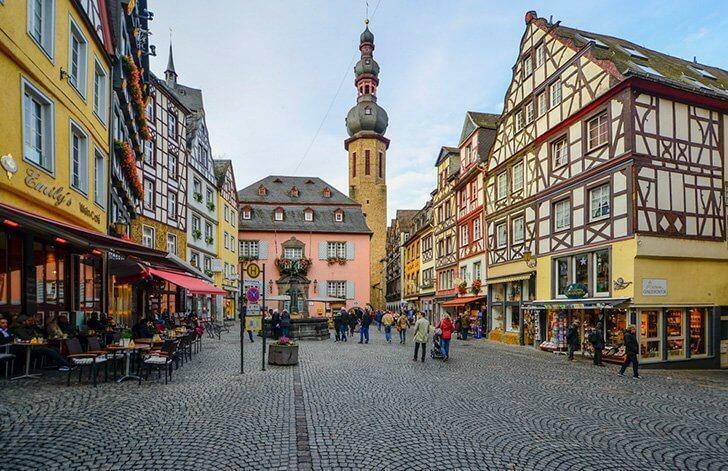 Its Old Town is lined with cobblestone streets and half-timbered Medieval and early Renaissance buildings. The 13th-century, Gothic Eglise Saint-Martin church dominates the town. Colmar is a popular tourist destination, so I recommend leaving early and staying until late afternoon to avoid the crowds. Trift Bridge is a challenging hike. Trift Bridge in Switzerland is roughly 3.5 hours from Stuttgart so starting early is essential if you want this to be a day trip. I have to warn you; this is a trip to take on only if you are not new to hiking as getting to the bridge is a 2h inclined hike on uneven terrain. 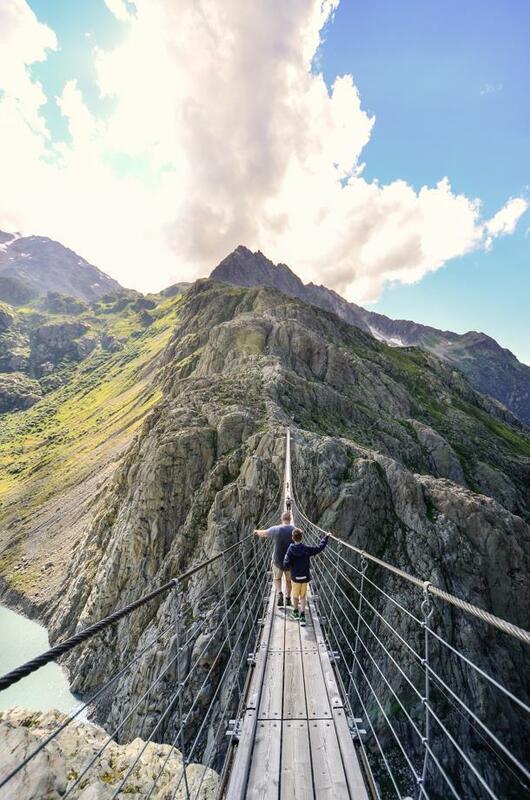 The Trift Bridge is the longest pedestrian-only suspension bridge in the Swiss Alps, spanning 170m (560 ft) at a height of 100m (330 ft). It offers a superb view of the Trift Glacier, melting into the Triftsee (the lake formed by the glacier’s meltwater). From here, you can climb higher up the mountain, but we did not have the strength or the time to continue. We were in pain during and after the hike, but we do not regret the trip. The scenery was superb and the bridge well worth the effort. We found Aareschlucht or the Aare Gorge by mistake. We were going to see Trift Bridge and because there were no more tickets available we had to turn back. The trip was not a bust as on the way back we spotted signs for the gorge. 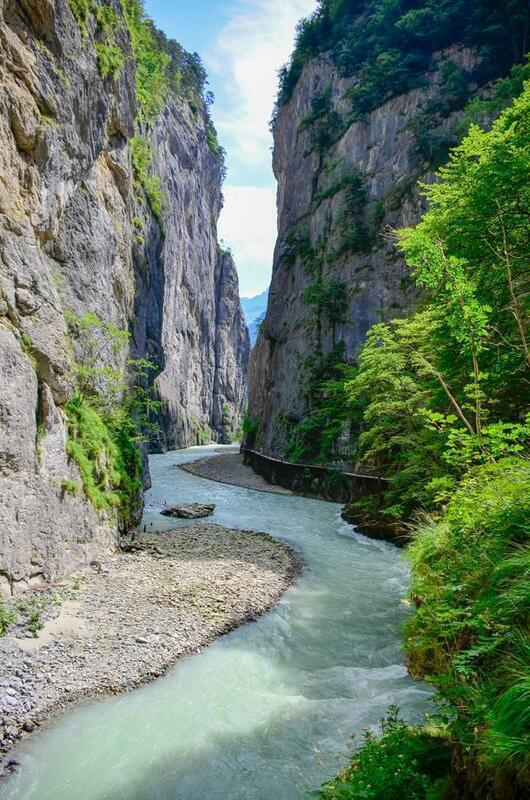 Over thousands of years, the Aare River carved a path through the rock, resulting in a gorge that is 1400m long and up to 200m deep. The gorge has been accessible for by a system of safe paths and tunnels for more than 100 years. The walk through the gorge is a special way to experience nature. Without traffic, it’s 3.5 hours from Stuttgart. 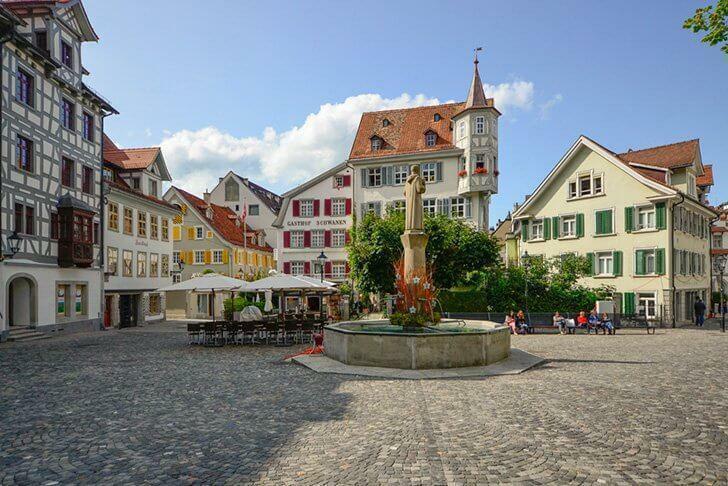 St. Gallen in Switzerland makes a great day trip from Stuttgart, Germany. The city of St. Gallen was founded in the 7th century and is home to an imposing library located in the Abbey of Saint Gall, a UNESCO World Heritage Site, which contains manuscripts dating the 9th century. Once I discovered this library in one of my many online destination searches, I knew I had to visit it, as it was built in the lavish Rococo style, an architectural style I adore. 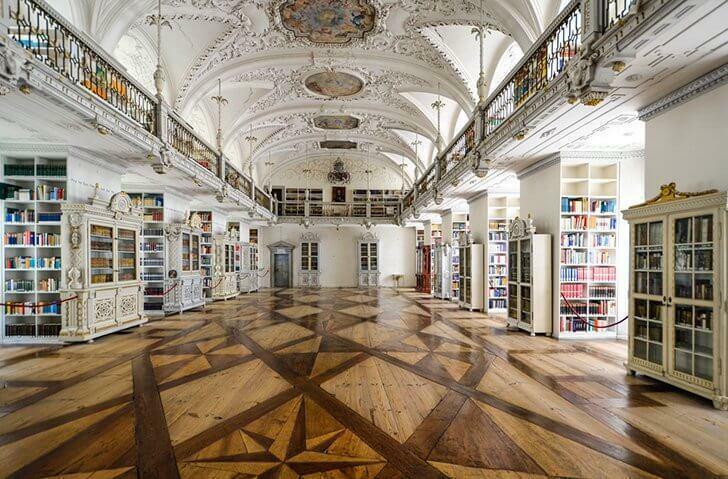 The Abbey Library is not only Switzerland’s oldest library, containing a unique collection of books and manuscripts, but also a public lending library. The library owns some 170,000 books and other media. Books printed after 1900 can be borrowed, whereas the other, older volumes can only be used in the Reading Room. 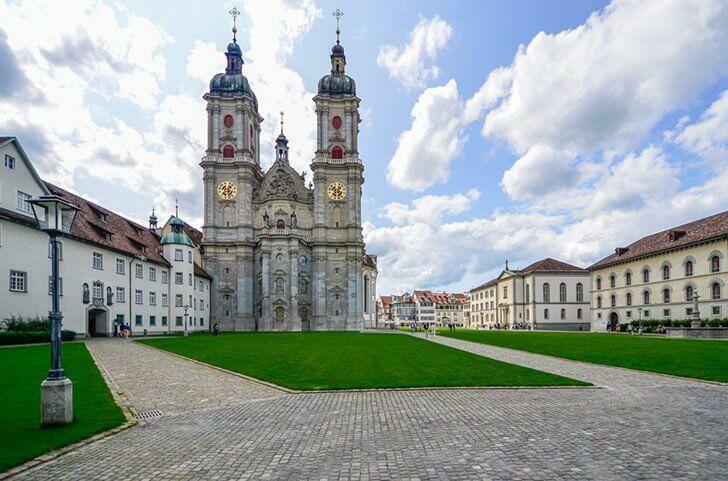 St. Gall Cathedral is on of the highlights of this Swiss city. Apart from visiting the library, take time to explore the town as well as the Cathedral itself. It will certainly impress you as it did us. The beauty of living in Europe is there are countless day trips you can take at a minimal cost. This article is only a small fraction of all the travel options available while visiting the Stuttgart area, and I hope I managed to make you hungry for adventure. All you have to do is pick a destination and go. You will be rewarded with memories to last you a lifetime. Of course, you don’t have to leave Stuttgart to find great things to do in Germany. Pick up your StuttCard to save money on museums and attractions and be able to skip the lines. 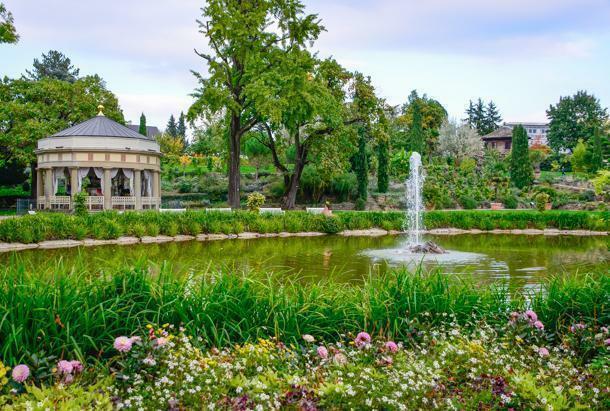 Don’t miss the incredible Wilhelma Zoologisch-Botanischer Garten, a family favourite, and be sure to check out some of the best festivals in Stuttgart. 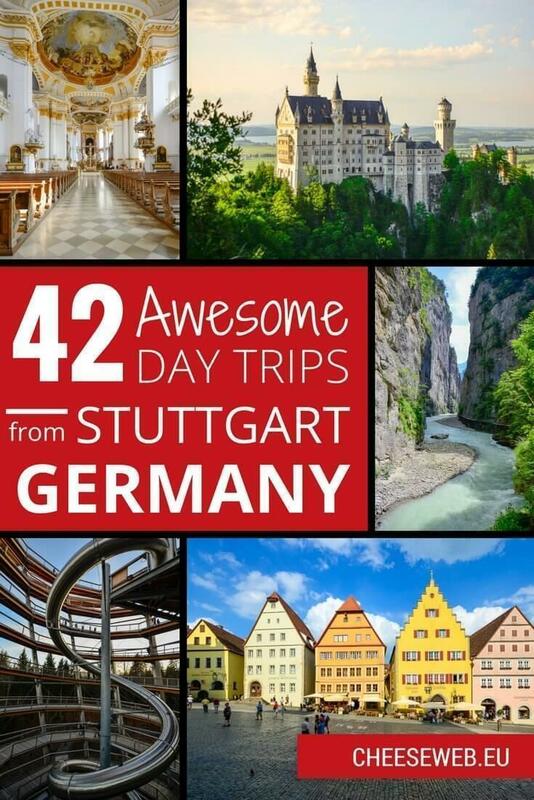 You can also check out some of the best tours of Stuttgart and book in advance. Need a hotel in Germany? Check out the best available rates here.